For other people named Katie Lee, see Katie Lee (disambiguation). 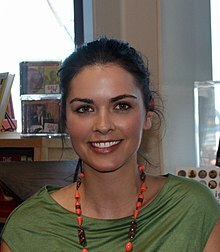 Katherine "Katie" Lee (born September 14, 1981) is an American cookbook author, television food critic, and novelist. Lee was raised in Milton, West Virginia. Lee studied journalism and food science at Miami University in Oxford, Ohio, where she graduated in 2003. While there she was a member of Kappa Alpha Theta. She spent a semester abroad in Florence, Italy at The British Institute. She met Billy Joel at the rooftop bar at The Peninsula hotel while visiting New York City for a weekend. After dating for a year, she and Joel married at his home in Oyster Bay, Long Island, on October 2, 2004. Alexa Ray Joel, Billy Joel's daughter from his marriage to Christie Brinkley, served as maid of honor. After nearly five years of marriage, Billy and Katie Lee separated in June 2009. On March 22, 2018, Lee got engaged to television producer Ryan Biegel at the La Réserve Hotel and Spa in Paris. They were married on September 1, 2018 at Lo Tommaso Allo Scoglio in the seaside village of Marina del Cantone on Italy's Amalfi Coast. Lee has worked in several restaurants and gourmet food and wine stores. In 2003, she helped to open Jeff and Eddy’s Restaurant where she served as the house fishmonger. In July 2005, Lee created the foodie website OliveAndPeach.com with partner Aleishall Girard. The web site ceased updating in September 2006. In 2006, she hosted the first season of Bravo's Top Chef. Subsequently, Bravo replaced her with Padma Lakshmi. She later returned as a guest judge on Top Chef All Stars, Episode 2 ("Night at the Museum") in 2010. In June 2011, Lee released her first novel, Groundswell, about a woman recovering from divorce who finds the healing power of surfing. Lee served as a food and lifestyle contributor for The Early Show and has appeared on Extra as a special correspondent. Additionally, she is a contributing editor to Gotham magazine, and her culinary and lifestyle column, "Katie's Kitchen", is published weekly in its sister magazine Hamptons. Lee has also appeared on Paula's Party, Martha, Today, The Early Show,The Nate Berkus Show, Rachael Ray Show, and Fox News. In 2007, she was a judge on Iron Chef America. Lee is a member of the Feeding America Entertainment Council. She previously sat on the council of Chefs for Humanity, a group that provides humanitarian aid worldwide. She has also volunteered for Les Dames d'Escoffier, an organization that educates and mentors women in the culinary profession. Lee appeared on the video blog Wine Library TV with Gary Vaynerchuk on May 8, 2009. Lee has been a guest judge on Beat Bobby Flay many times, including on July 21, 2016 for a special "Ladies Night" episode. Lee is a co-host of Food Network's talk show The Kitchen, and the Cooking Channel's Beach Bites with Katie Lee. ^ Schruers, Fred (2014). Billy Joel. Crown Archetype. p. unnumbered. ISBN 9780804140195. ^ Reasons-Pyles, Katherine (n.d.). "Home for the Holidays". Huntington Quarterly (76). Huntington, West Virginia. Archived from the original on January 21, 2012. Retrieved April 16, 2015. ^ Landman, Beth (October 21, 2009). "Katie Lee, Movin' Out". New York. Archived from the original on January 31, 2014. Retrieved April 16, 2015. ^ Tavares, Kim (March 31, 2015). "Pulitzer Prize winners to give keynote address at annual Women in Leadership Symposium" (Press release). Miami University. Archived from the original on April 16, 2015. Retrieved April 16, 2015. ^ "Katie Lee Joel to host Bravo's upcoming 'Top Chef' reality series". Reality TV World. October 2, 2004. Retrieved September 18, 2012. ^ a b Sendor, Rosalie. "Katie Lee Joel Talks About Food". GreatRestaurantsMag.com. Archived from the original on December 22, 2008. ^ Winfrey, Oprah (January 1, 2006). "Billy and Katie Joel Movin' Up". Oprah.com. Archived from the original on September 26, 2013. Retrieved December 13, 2012. ^ "Food Network's Katie Lee Is Engaged!". E! Online. Retrieved March 26, 2018. ^ "Katie Lee Packs Her Knives". Televisionaryblog.com. June 20, 2006. Retrieved September 18, 2012. ^ "Padma to replace Katie Lee". Televisionaryblog.com. June 27, 2006. Retrieved September 18, 2012. ^ Boncompagni, Tatiana (May 11, 2008). "Downtown-Uptown Girl". The New York Times. Retrieved May 7, 2010. ^ De Heer, Sarah (December 2, 2009). "'The Comfort Table: Recipes for Everyday Occasions' - Cookbook Spotlight". Slash Food. Retrieved December 12, 2012. ^ Steinke, Lisa (June 21, 2012). "Katie Lee talks Groundswell". She Knows. Retrieved December 12, 2012. ^ a b "Chefs for Humanity Home Page". Chefsforhumanity.com. Retrieved September 18, 2012. ^ "Feeding America Celebrity Partners". FeedingAmerica.org. Retrieved December 12, 2012. ^ "Chefs for Humanity Home Page". Chefsforhumanity.com. Retrieved September 18, 2012. ^ "Domestic Rosé Tasting With Katie Lee Joel – Episode #673". Tv.winelibrary.com. May 8, 2009. Retrieved September 18, 2012. ^ "Beat Bobby Flay – Ladies Night". July 21, 2016. ^ "The Kitchen". Food Network. 2014. Retrieved February 23, 2014. ^ "Beach Bites with Katie Lee". Cooking Channel. Retrieved July 1, 2016. Wikimedia Commons has media related to Katie Lee Joel.